lango, best known as an important habitat and pathway of migratory birds, paints a typical picture of the Philippines’ numerous small island communities: low-income, densely populated and groaning under the strain of ever-increasing pressure on its resources. The island has 20,000 human residents packed on 1,014 hectares of land. It lies only 5 km east of Mactan Island, a major tourist destination in Cebu, but its residents realize few benefits from the influx of tourists in the area. And despite its proximity to the highly urbanized Cebu City, the island lacks basic infrastructure such as water supply and waste disposal systems. Not surprisingly, Olango residents are heavily dependent on fisheries. Of the estimated 4,000 households, 75% are engaged in fishing or related livelihood activities based on the extraction of coastal resources. 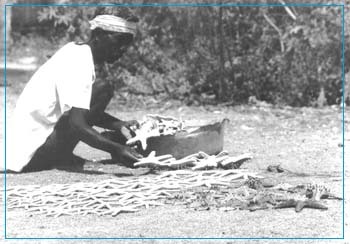 The fisheries around the island have long been depleted. According to the Olango fishers’ themselves, the average daily fish catch dropped from about 20 kg per fisher in 1960 to less than 2 kg today. Two reasons are often cited: increased population pressure and the use of destructive fishing practices. But Olango is perhaps luckier than other coastal communities in similar circumstances. It is one of six learning areas of the Coastal Resource Management Project (CRMP), a technical assistance project implemented by the Department of Environment and Natural Resources (DENR) and supported by the United Agency for International Development (USAID). Through community-based coastal resource management, CRMP aims to reverse the tide of destruction that continues to threaten Olango’s coastal resources and the economic well-being of its people. Starfish being dried for the curio market in Cebu. Olango is composed of 11 barangays (villages), 8 of which belong to Lapu-Lapu City and 3 to the municipality of Cordova. In many respects, Olango and its surrounding islets are resource-poor. Freshwater is scarce. There are no rivers or streams and the only wells are located in the center of the island. Fewer than 10% of the wells are freshwater; due to saltwater intrusion, the remainder are either brackish or saltwater. To augment groundwater supply, islanders collect rainwater for their freshwater needs. The surrounding islets have even less water and rely on Olango for the little freshwater that is available there. Residents of Pangan-an Island at the southern tip of Olango, for example, pay as much as P5 for a gallon of water. In the long dry spell of 1997 and 1998, they had to buy water from the mainland, a 20-minute motorboat ride. The seas around Olango might have once teemed with life, but they are now depleted and degraded. Most of the fishers are poor. Children often quit school to help their families fish or glean for a living, and sometimes just for food. Many fishers resort to whatever methods produce the highest catch, even when they are aware of the damage caused by some of these methods. The lucrative aquarium market, for example, provides an irresistible incentive for many fishers to use sodium cyanide, the easiest way to catch tropical ornamental fish. Similarly, catch volume and associated returns from blast fishing make this method more desirable to fishers than more traditional techniques. The prolonged use of cyanide and blast fishing, as well as overfishing, has all but decimated that fishery resource base of Olango. As a result, fishers there have to travel farther and farther out to catch anything of substantial value. This has earned them the ill reputation of being nomadic fishers prone to wanton use of destructive fishing methods, particularly cyanide, in nearby Negros, Siquijor, Samar and as far as northern Indonesia. Another major issue cited by residents, especially around Pangan-an Island, is the encroachment of trawlers in their municipal waters. Fishing boats larger than 3 gross tons can reap in one evening a month’s worth of fish catch to a small-scale fisher. In the past, when a trawler entered Olango’s territorial waters, Sabang and Pangan-an fishers flocked to the Save Nature Society (SNS) Field Station in Sabang to ask CRMP’s staff to contact the Coast Guard for assistance. But coastal law enforcement has been erratic, allowing illegal commercial trawling activities to prosper. Desperate to harvest the resources of their own waters rather than have the commercial trawlers benefit, islanders resort to other forms of illegal fishing, blast fishing and cyanide being the most common, perpetuating the vicious wave of destruction that keeps them mired in poverty. And so, poverty and alienation continue to plague the people of Olango. Fishers’ families earn a monthly income of only P1,500, and families of unskilled laborers eke out as low as P450. Opportunities for employment are few and far between. And, with more and more people relying heavily on coastal resources for their very survival, depletion and destruction of the coastal and marine environment continue to rise sharply. Mactan’s tourism boom not only has not benefited the islanders; in fact, it has sometimes aggravated their problems. Tour operators from Mactan bring scuba divers to Olango’s waters, particularly those around Hilutungan Island, a marine sanctuary. Some of these visitors, who are not required to pay an entrance fee for the use of the island’s reefs, blatantly fish inside the sanctuary, as the islanders have no means of patrolling the waters and enforcing restrictions. Indeed, on the whole, local communities feel they have not benefited from tourism development, even when this happens right in their own backyard. The Olango Island Wildlife Sanctuary (link to story on Olango – May 1998 issue of Over Seas) is an internationally renowned preserve for migratory birds touted as being potentially beneficial to the residents. But residents assert a lack of benefits from its existence. Fisherfolk used to traverse the area to reach their fishing grounds or to glean; now it is off-limits to fishing activities. There is no question that the Philippines needs viable parks and sanctuaries to preserve its rich biodiversity, and the significance of Olango Island as a critical habitat for migratory and resident bird populations cannot be dismissed. Clearly, a compromise between the needs of the residents and the necessity to protect this unique and environmentally sensitive area must be sought. In the last few years, Olango has seen the beginnings of coastal resource management (CRM), which is now starting to take hold. Different groups are engaged in CRM efforts to help address the issues plaguing Olango and provide long-term, viable solutions. In April 1997, the Olango Synergy Group was created, with members from different sectors, including local government units (LGU), national government agencies (DENR, Department of Agriculture-Bureau of Fisheries and Aquatic Resources or DA-BFAR), CRMP, non-governmental organizations (NGOs) such as the SNS, the University of San Carlos (USC) and various church and youth groups. These members share information to prevent overlapping of activities and determine the best plan of action for development in Olango. At the end of 1997, a team of trainers and community development workers from the International Marinelife Alliance-Philippines (IMA) entered the community to teach fishers, especially cyanide and blast fishers, alternative methods of catching fish. Some 300 ornamental fish collectors have been identified, most of them from San Vicente and Sta. 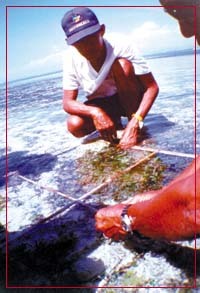 Rosa, and trained in the use of the barrier net method and hook-and-line techniques. Such activities are part of the overall CRM process currently being facilitated by CRMP in collaboration with the local government. To ensure community involvement in the process, CRMP employs participatory methods, beginning with what is called "participatory coastal resource assessment," (link to sidebar below) or PCRA. Through PCRA, the Project enables the local community to be actively involved in assessing their own resources and looking at ways to better manage these resources. At Olango, CRMP worked with the DA, DENR, IMA and marine biologists from the University of San Carlos to facilitate PCRA. the different seagrasses in their village coastal waters. More than 100 Olango residents participated in on-site resource assessment, surveying mangroves, seagrass beds and coral reefs, as well as conducting interviews. They recorded and presented their findings, and even drew detailed maps of their respective barangays, all of which will go into Olango’s coastal area profile presently being compiled by the University of San Carlos. The coastal area profile will provide baseline information necessary for planning and future resource monitoring and assessment, and enable the residents themselves to evaluate CRM issues and constraints in their community. 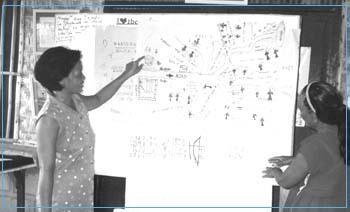 Because many of Olango’s resource problems stem largely from economic need, enterprise development is a key element in the CRM plan now being mapped out for Olango. Promoting enterprises that are site-specific and commodity-specific, CRMP aims to enhance the way local residents use their coastal resources in strategically positioned communities while promoting environmental sustainability. For instance, activities at Sabang and Hilutungan are focused on enterprises that promote upkeep of the coastal environment. These include ecotourism development in two of Olango’s unique and critical coastal environments: the Olango Island Wildlife Sanctuary and the Hilutungan Marine Sanctuary. Seaweed farms have also been planted at Sabang and Hilutungan, with fishers, the youth and women identified as beneficiaries. the Olango Birds and Seascape Tour. There have been initial successes. Residents are buoyed by the high degree of interest shown by the tourism industry in the "Olango Birds and Seascape Tour" <link to story on Olango in May 1998 issue of Over Seas> that they themselves help organize. Participants in the seaweed farming projects are also encouraged by the market potential of their produce; they are set to sell their first harvest in March. To restore the health of the coastal resources and the people of Olango, CRMP will continue to work with a broad cross-section of coastal stakeholders including the community, local government, national government, academe and non-governmental organizations to reduce fishing effort, stop illegal and destructive fishing practices, and protect and manage critical coastal habitats. Besides developing alternative enterprises to benefit coastal resource users and reduce fishing pressure, the Project aims to create an island-wide CRM council. This council will include representatives from each barangay, DENR, the Protected Area Management Board of Lapu-Lapu City, the youth, and private sector (resort owners, tour operators). It will examine CRM issues and draw up resolutions to address these issues while providing the opportunity for representation by all stakeholders and increasing the level of awareness and involvement of the community at large. To address potential resource use conflicts, a zoning plan will designate specific uses for different zones based on the best feasible economic and environmental use of the areas. There are, even now, some problems related to conflict of interests. For example, San Vicente is complaining that seaweed farms in Hilutungan are encroaching into San Vicente waters, preventing residents from fishing there. At Nalusuan Island, meanwhile, a private resort owner created a marine sanctuary which needs to be reviewed in light of its effect on the various stakeholders involved. Resolving conflicting resource uses should result in the protection and management of critical habitats, especially coral reefs and seagrass beds, which are needed to rehabilitate damaged habitats and restore the productivity of fisheries in the area. Olango’s challenge, while not unique, is no doubt great, if not daunting. But there, at least, concrete steps are being taken to translate challenge into opportunity, and opportunity into a brighter future for the greater number of its people. The PCRA Process is described in its entirety in CRMP’s publication "Participatory Coastal Resource Assessment: A Handbook for Community Organizers and Coastal Resource Managers." Click here to download. Download Proposed Management Plan for the Olango Island Wildlife Sanctuary. For additional details on some Philippine wetlands, check out Report on the Rapid Assessment of the Tres Marias Islets, Palompon, Leyte and Other Ramsar Sites in the Philippines. This website was made possible through support provided by the USAID under the terms of Contract No. AID 492-0444-C-00-6028-00. The opinions expressed herein are those of the authors and do not necessarily reflect the views of USAID. Articles may be quoted or reproduced in any form for non-commercial, non-profit purposes to advance the cause of marine environmental management and conservation as long as proper reference is made to the source.